If you work in a country that is not your own, chances are you sometimes wonder about which crops to grow and promote. A good first step is to find out what is already being grown in-country. It will quickly become obvious what the staple grains are. Less apparent, and often greatly under-utilized, are indigenous (naturally occurring) and traditional (introduced in the past and incorporated into the culture) leafy vegetables. In many areas, the knowledge and use of indigenous leafy vegetables (ILVs) has declined as vegetables such as cabbage, tomatoes and carrots have gained prominence. In recent years, however, organizations such as the Asian Vegetable Research and Development Center (AVRDC), Bioversity International, and Fam Concern International have been influential in promoting ILVs. Consequently, there may well be growing interest in and new opportunities to market ILVs. Resource-poor farmers can easily grow ILVs, as these plants are well-suited to local conditions and thrive with minimal inputs (e.g. water and fertilizer). Moreover, ILVs are important sources of vitamins A and C, iron and other nutrients. They are readily incorporated as supplements to carbohydrate-based staples. When looking for ILVs, expect the unexpected. In Tanzania, I saw a species of nightshade (Solanum scabrum) being grown for leaf consumption on local farms around the city of Arusha. Nightshade is often thought of as a poisonous weed; plants in this family contain varying amounts of solanin, which is poisonous if present in high enough levels. Boiling reduces solanin content, and cooked leaves of several species (Solanum scabrum, S. americanum, S. villosum) are eaten in parts of Africa. You will also see crops that, instead of being grown for their seeds (e.g. cowpea) or tuberous roots (e.g. 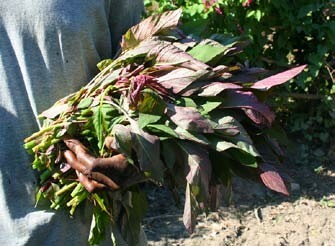 sweet potato), are being cultivated for their leaves. It would be interesting and worthwhile to conduct your own variety trials to identify cowpea and sweet potato varieties that produce an abundance of edible leaves. Figure 3: Amaranth leaves (Amaranthus sp.) in Haiti. Photo by Larry Yarger. Amaranthus species: The genus Amaranthus includes as many as 800 species, some of which have been cultivated since as long ago as 6700 BC. Some Amaranthus species are best suited for grain production (A. cruentus; A. hybridus; A. hypochondriacus), while others are grown for their leaves (A. tricolor; Figure 3). The leaves of grain types can also be eaten. A few noteworthy vegetable varieties (of the species A. tricolor) at ECHO are Jamaican Calalu and Tigerleaf R135. Amaranth leaves are noted for their high protein, mineral and vitamin content. More information can be found in ECHO’s Amaranth Technical Note, available on our website. Vigna unguiculata (cowpea): Cowpeas are often grown for the seeds harvested from mature, dry pods. The leaves are also edible, served boiled or fried along with a staple porridge. ECHO’s seed bank carries two varieties (#83-060 and Zipper Cream) that, in our trials, have been found to have a more spreading growth habit favorable for leaf production. When used as a vegetable, the young leaves are harvested beginning about four weeks after the seeds are planted. Corchorus olitorius (jute mallow): Native to Africa, jute mallow is widely cultivated in both wet regions of the Sub-Sahara and drier areas of North Africa. Young leaves and shoot tips can be eaten raw or cooked, and contain high levels of protein and vitamin C. Jute mallow leaves can also be dried, ground into powder and stored for use during the dry season. It is grown as an annual, though it may act as a perennial in some locations. The fibers can be used in making twine, cloth and burlap. Solanum scabrum (edible African or broad-leaved nightshade): In 2008, ECHO obtained and multiplied seeds of this vegetable nightshade species. It has broader leaves and, thus, greater leaf production than two other cultivated African nightshade species, S. americanum or S. villosum. It is also less bitter than other African nightshades. Prepare the leaves by boiling and discarding the water. Also consider leafy greens such as moringa (Moringa oleifera and M. stenopetala), chaya (Cnidoscolus aconitifolius), and katuk (Sauropus androgynus). Because they are perennials, these plants can be harvested for many years after planting the initial seed (moringa) or cutting (chaya and katuk). Another helpful resource is the book Edible Leaves of the Tropics.